Home / Blog/ The Hair Color Wheel - The Secrets to Color Neutralization and Tone Correction that All Hair Stylists Need to Know! The Hair Color Wheel - The Secrets to Color Neutralization and Tone Correction that All Hair Stylists Need to Know! Each color has a relationship with every other color. The Hair Color Wheel is a way of showing this relationship. Q: How can the Hair Color Wheel Help me as a Colorist? You lifted a customer’s hair with bleach but there is still yellow left in the hair. You lifted a customer’s hair from dark brown to blonde but there is still orange left in the hair. You lifted a customer’s hair from dark brown to brown but there is still red left in the hair. Green cancels out red on hair that has been lifted to brown or light brown. Blue cancels out orange on hair that has been lifted to dark blonde. Violet cancels out yellow on hair that has been lifted to blonde. 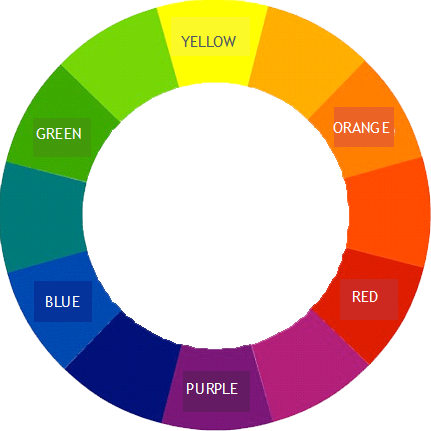 In each case you are using the opposite color on the color wheel to counteract the unwanted red, orange and yellow. The technique here is to add in a very small quantity of the opposite color. The normal mix ratio would be 1 inch of green/blue/violet added to 1 tube of regular color. Add in the same amount of developer. 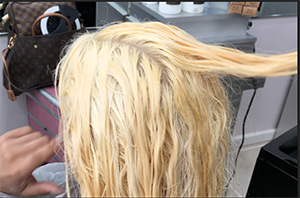 IN THE VIDEO BELOW, GREEN WAS ADDED TO 7.1 to NEUTRALIZE AN IMPOSSIBLY ORANGE HAIR COLOR. WATCH NOW! Q: Can I also use Ash Based Colors to Kill Brassy, Orange or Yellow Hair? A: Yes, by using Ugly Duckling's Ash Colors. Ugly Duckling's regular ash colors are green based - in fact they contain a lot of green! (more than most color ranges). They go all the way up to level 10. 3.11, 4.11, 5.11 are double ash reflects - extra amounts of green based ash to fight red on dark bases. Ugly Duckling also has a blue based ash series. These go from 6.1b up to 10.1b. The blue based ash colors are excellent for fighting yellow on medium blonde and light blonde bases. So as a general rule, when fighting redness on relatively dark bases, choose the green based ashes. And when fighting yellow on relatively light bases, choose the blue based ashes. Incidentally, note that both ash colors also give very pretty and distinct reflects on their own. Q: Is there Any Other Way of Neutralizing Warm Tones? Ash Grey Additive has been developed to add in green for bases up to level 6. You can add in an inch of this into your color mix. This helps counteract brassiness (yellow/orange) in brown hair. Ash Blue Additive has been developed to add in blue for bases 6 and up. You can add in an inch of this into your color mix. This helps counteract brassiness (yellow) in blonde hair. The recommended technique here is to squeeze in a little of your chosen ash additive (around 1 inch is good to start with) to a full tube of the blonde color that you are using. Note that these additives will tend to take your color level down by about 1 tone. Q: Can I also use Toners to Kill Brassy, Orange or Yellow? Ugly Duckling's toner range have been formulated with exactly that aim in mind. They have very fast acting pigments which typically neutralize in around 10 minutes. Use Pearl Blonde Toner or Silver Blonde Toner when the lift is correct (level 10). When using toners it is really important to pre-lighten dark areas of the hair and get everything up to as close to level 9/10 as possible. Q: I'm doing all that but I am still not getting the Ashy Blonde Result that I am looking for. What am I doing wrong? A: Almost certainly you need to lift the hair more. If you are looking for a white blonde or an ashy blonde, color neutralization from a dark level will not work. Almost certainly you need to lift the hair more. Use a quality lightener and lift the hair up, ideally all the way to level 10. That way you will get rid of all yellow and orange. Then apply a toner as above. Q: My hair pulls orange. What should I do? A: Sorry, there is no such thing as hair that "pulls orange." There is, however, such a thing as a stylist that does not lift enough! Don't misuse the color wheel and think you can just dump in ash and more ash and kill brassiness. It doesn't work like that. Hair has its natural melanin which is causing that orange and that brassiness. You need to remove that first. Lift up the hair to a true level 9/10. Use a quality lightener that works well on dark hair. Then apply your ash toners as above. You will get a much better result. Q: My customer has dark hair. She wants to go blonde. How do I get rid of all the orange as I lift? A: It is totally possible to lift dark hair all the way up and get rid of all orange or yellow. The key is lifting and continue to lift until you get to a very consistent level 9/10. Then tone. We do recommend you use Brilliant Blonde when you have "heavy lifting" to do. It lifts faster and more than most lighteners on the market. We also recommend you use Ugly Duckling pearl blonde and silver toners. They are very heavily pigmented and provide for fast and effective toning.